The weather looked very promising for birding this morning. When I woke up it was alternating between drizzle and downpour. I was intending to go to Uplands Park, but as I meandered my way along I instead turned up to Mount Tolmie on a whim. I hadn't been to the Mount Tolmie Reservoir in a while, so I started there. As I walked along the perimeter, I pushed up a few Savannah Sparrows. That was my first sign that it was quite "birdy" up there. 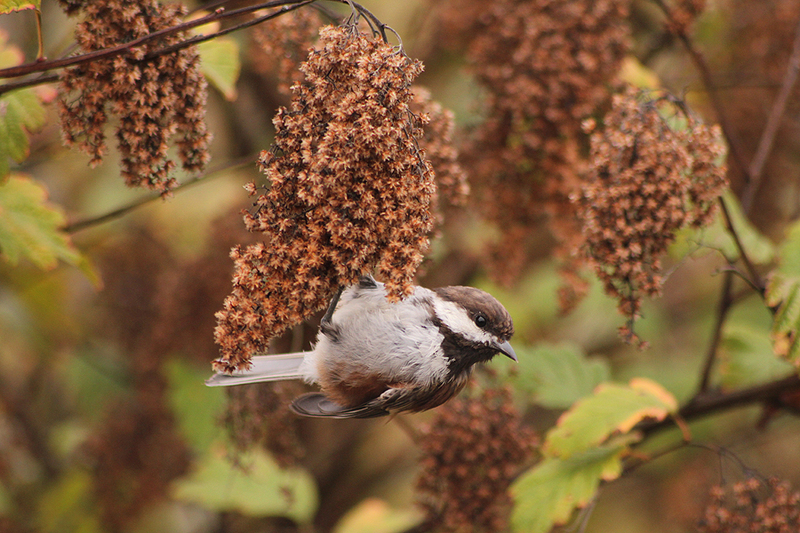 I continued to walk the perimeter and wracked up the species one after another: Orange-crowned Warbler, Dark-eyed Junco, Golden-crowned Kinglet, Yellow Warbler, Fox Sparrow, White-crowned Sparrow, Townsend's Warbler, and Chestnut-backed Chickadee. The best bird I heard here was an Evening Grosbeak giving its clear, whistled call note as it flew over. I followed this up with my only Western Tanager of the morning. I had seen quite a few species, but I wouldn't exactly call this a fallout. I drove up over the top and parked in the lot just below. From there, I walked around on the north-facing slope and this is where the real action was going on. I surveyed the scene from a rock outcrop by the parking lot and could see Orange-crowned Warblers actively flitting through the assortment of shrubs and stunted Garry Oaks below. 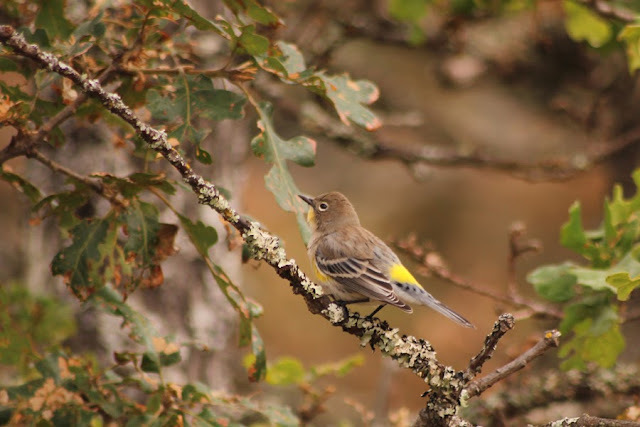 The odd Yellow-rumped Warbler could be heard giving their distinctive call note while hawking insects. I decided to move down the slope to put myself in the centre of the action. It was amazing! The bulk of the bustle was occurring in the Oceanspray shrubs. I get the impression the dead, drooping flower clusters are loaded with insects and arachnids. 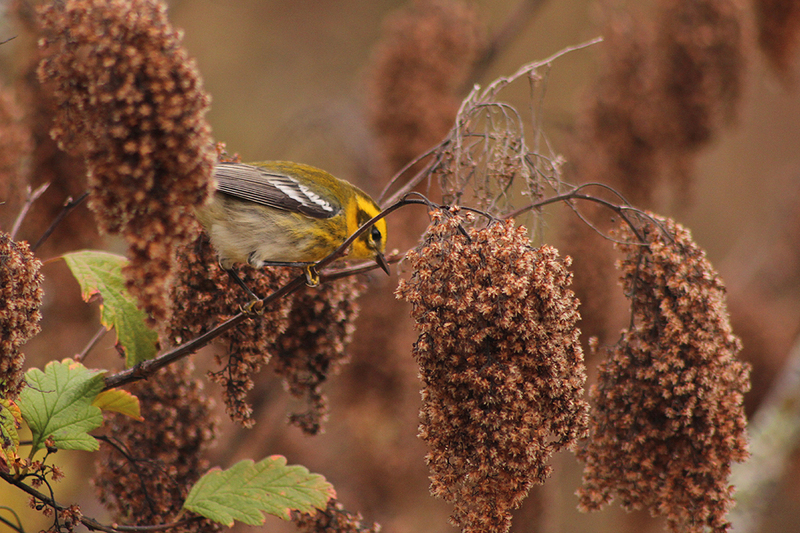 I figure there must have been over a hundred Orange-crowned Warblers on the hill this morning. 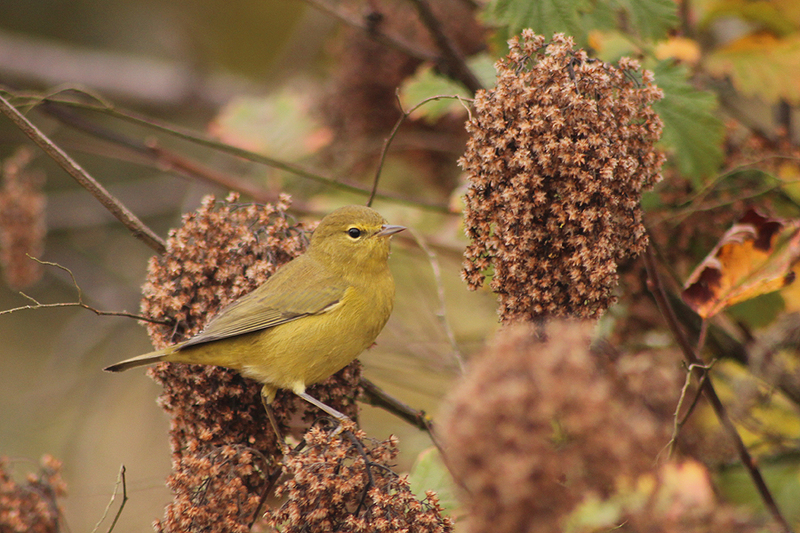 At one point, I stood by a small Oceanspray patch with my camera at the ready for Orange-crowned Warblers to work their way into the open and hopefully cooperate for a photo or two. I was managing the odd photo here and there and then I heard the high-pitched "tick" note of a Townsend's Warbler right in front of me! Somehow a Townsend's had snuck in without detection. I worked the flocks of Orange-crowned Warblers over and over, but I couldn't find anything unusual. The area east of the upper parking lot had another wave of activity that consisted primarily of Yellow-rumped Warblers, but I also had a Hammond's Flycatcher and Warbling Vireo in the mix. 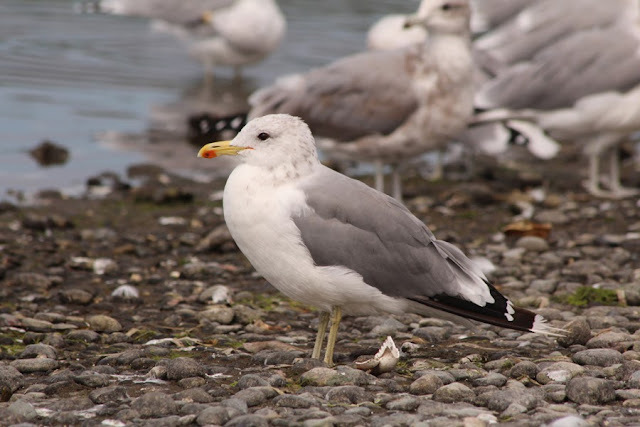 I decided to move on from Mount Tolmie and ended up putting in a very unfocused effort for the Franklin's Gull at Esquimalt Lagoon. 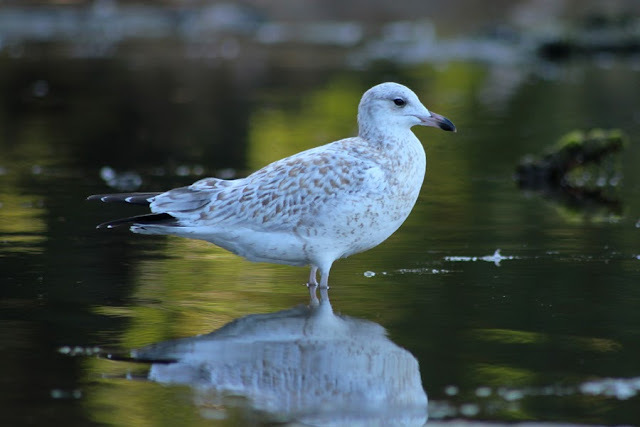 This bird was first found by Mike Ashbee on September 2 and many birders have been able to enjoy this local rarity. I had not put in an effort and I decided I would give it a half-hearted effort on my way through to Albert Head Lagoon and Tower Point. I pulled in to the parking area just after the bridge and was impressed by the number of gulls. I apparently wasn't impressed enough to get my scope out and scan through, but I did give it a cursory scan. No signs of the Franklin's there. 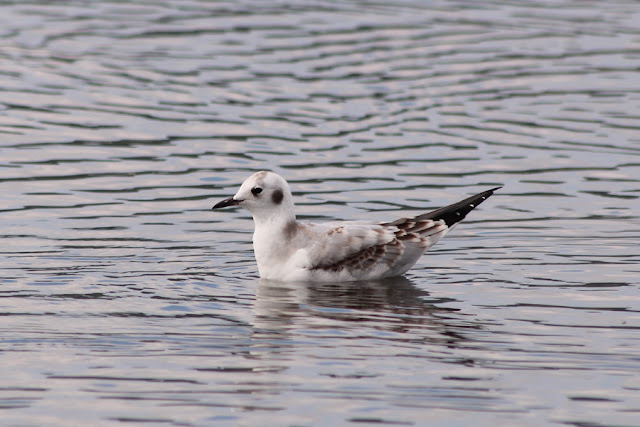 I went to the "hump" at the halfway point of the lagoon next as this is where the Franklin's Gull has been putting in appearances. 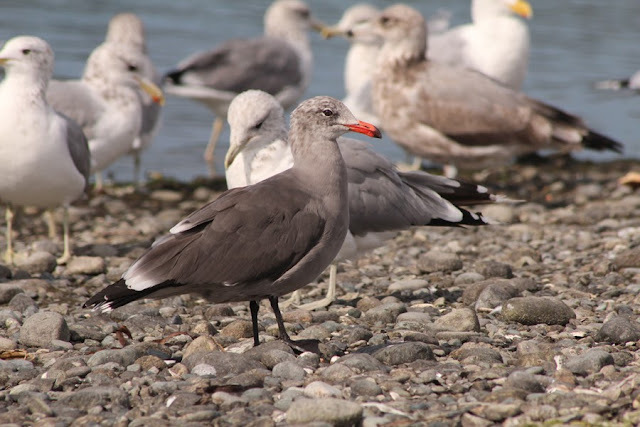 The usual assortment of California, Heermann's, and Glaucous-winged Gulls was there, but there was no signs of the money bird. I was pleased, however, to find four Bonaparte's Gulls paddling their way along the water's edge. Albert Head Lagoon was quiet for shorebirds and the horde of gulls offshore was made up of the usual assortment. The only highlight from this location was a juvenile Ring-billed Gull hanging in the southwest corner of the lagoon. I finished the day off at Tower Point with a bit of a seawatch and just enjoying the nice weather. I bumped in to Ian Cruickshank here and he had already picked over the area enough to tell me not to expect anything wild and crazy. He did mention Horned Larks were everywhere, but I don't seem to recall him saying there was a group at the point. 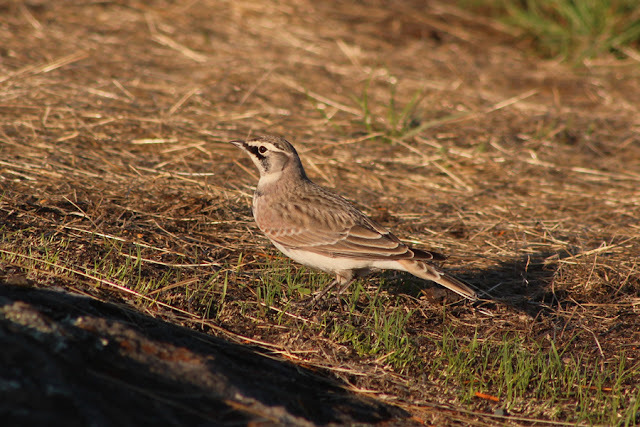 When I got out to the rock outcrops at the point, however, there was a group of eight Horned Larks scurrying over the rocks and grass. Aside from these birds, the only other bird worth mentioning from Tower Point was a lone Horned Grebe which was also my first southbound individual for the late summer. It was another great day outside and hopefully tomorrow will be equally eventful!